How the war shaped the lives of a generation of women, with guests including broadcaster Kate Adie and Baroness Shirley Williams. Jenni Murray presents the female perspective. How the war shaped the lives of a generation of women. While women in their thousands volunteered for war service and the number of women employed went up by more than a million by 1918, what power did women really achieve outside the home and how lasting was it? Joining Jenni Murray and Baroness Shirley Williams on the war's impact on the generation of her mother, Testament of Youth author Vera Brittain; writer and broadcaster Kate Adie; Joanna Bourke, Professor of History at Birkbeck College; and cultural historian Professor Maggie Andrews. We also hear about the work of doctors Flora Murray and Louisa Garrett Anderson who established and ran the only British army hospital staffed entirely by women, treating wounded soldiers. Jobs, bobs and the vote: Kate Adie asks what WW1 really did for women. 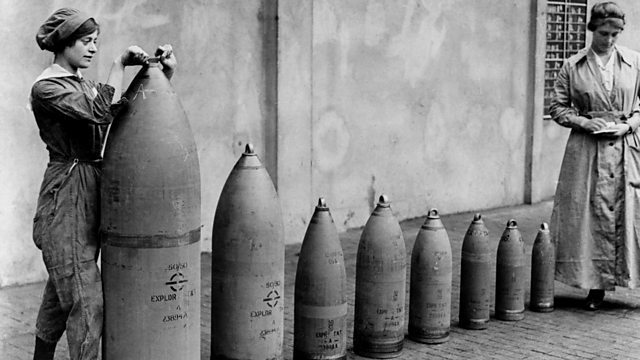 iWonder: What did World War One really do for women? WW1 – Opportunities for Women? What happened to women's place in society when the men returned from the front? It is estimated that 80,000 women served in the forces as non-combatants during WW1, with nursing, munitions and transport work helping boost the number of women in employment by more than a million by the end of the war. Others like author Vera Brittain, seized opportunities to nurse abroad as Voluntary Aid Detachments. While class played a role in women’s experience of wartime, expectations were transformed. In 1915 two doctors established the only British military hospital that was staffed entirely by women. Doctor Flora Murray and Doctor Louisa Garrett Anderson set up and ran the Endell Street Military Hospital on the site of a former workhouse in London at the invitation of the War Office. In four years, the hospital treated more than 24,000 soldiers. Flora Murray, doctor in charge, and Louisa Garrett Anderson, who was chief surgeon, had been active in the suffrage movement, adopting the ‘Deeds Not Words’ slogan as the hospital’s motto. Medical historian Dr Jennian Geddes talks to reporter Louise Adamson about their work. By 1917 women were estimated to be producing 80% of all munitions, while women’s trade union membership had gone up by 160%. But how fleeting did women’s hold on economic power prove to be in the face of men returning from the Front? Women’s political power was realised in 1918 when qualifying women over 30 gained the right to vote but what role had the war played? Baroness Shirley Williams has a career in politics that has spanned five decades. She served as a Labour minister before breaking away to co-found the SDP as one of the ‘gang of four’. As Baroness Williams of Crosby, she became Liberal Democrat leader in the House of Lords. Her mother, the writer Vera Brittain, published Testament of Youth in 1933. In a later preface to the book, Shirley Williams wrote that her own image of WW1 was gleaned from her mother who became a life-long pacifist. Her mother’s book had become the ‘undisputed classic book about WW1’. Kate Adie is a writer and broadcaster. She became the BBC's chief news correspondent in 1989 and has reported from war zones around the world and won numerous awards for her broadcasting. Her book ‘Fighting on the Home Front: The Legacy of Women in World War One’ was published in paperback in 2013. She is also the author of the BBC iWonder interactive guide: What did World War One really do for women? Joanna Bourke is Professor of History at Birkbeck College and the author of a number of books on the cultural history of modern warfare, including Dismembering the Male: Men's Bodies, Britain, and the Great War. Her interest in the experience of warfare is also explored in An Intimate History of Killing which includes WW1. She has also researched the history of the emotions, particularly fear and hatred and the history of sexual violence. Maggie Andrews is Professor of Cultural History at the University of Worcester and is an adviser to the BBC on its World War One at Home project. A key focus of her research is domesticity and femininity. She is currently completing an edited collection of writings, The Home Front: Images, Myths and Forgotten Experiences. Her previous work includes a feminist history of the Women’s Institute movement. Across WW1’s centenary year, Woman's Hour looks at the war’s impact on women’s lives.